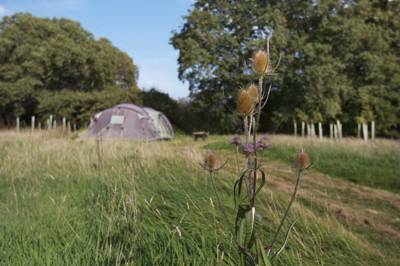 Over 20 acres of campsite to choose from over four separate meadows, each with its own unique feel. It's easy to marvel at the West Sussex High Weald and not realise the history hued in its landscape of sprawling heathlands, woodland pockets and scattered farmsteads. This irregular patchwork of undulating fields, snaked with ancient bridle paths is a living medieval landscape sculpted and shaped by the 14th century rural folk of these parts. As the years progressed and the rest of the world bore witness to the sweeping tide of industrialisation, this charming corner of south-east England remained wonderfully unspoiled for a region just a couple of hours from the capital. The lucky inhabitants of its quaint ridge-top villages have always had a healthy respect for the land which continues to this day, hence its status as an Area of Outstanding Natural Beauty. 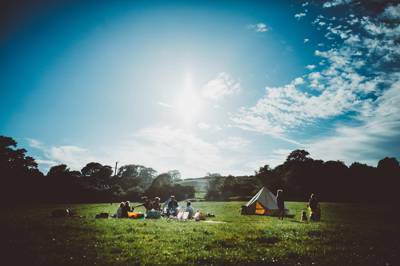 And it is on one such hilltop village, West Hoathly, that the Buckley family's vast former dairy farm now plays host to the region's loveliest back-to-basics campsite. 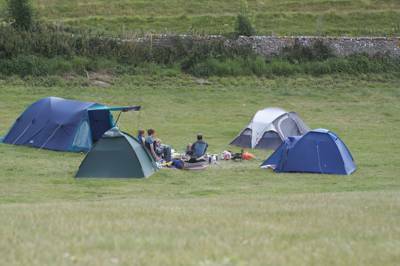 Spread over 20 acres of typically tranquil meadowland, Hook Farm is a tents only site site with space for just 10 privileged pitches. 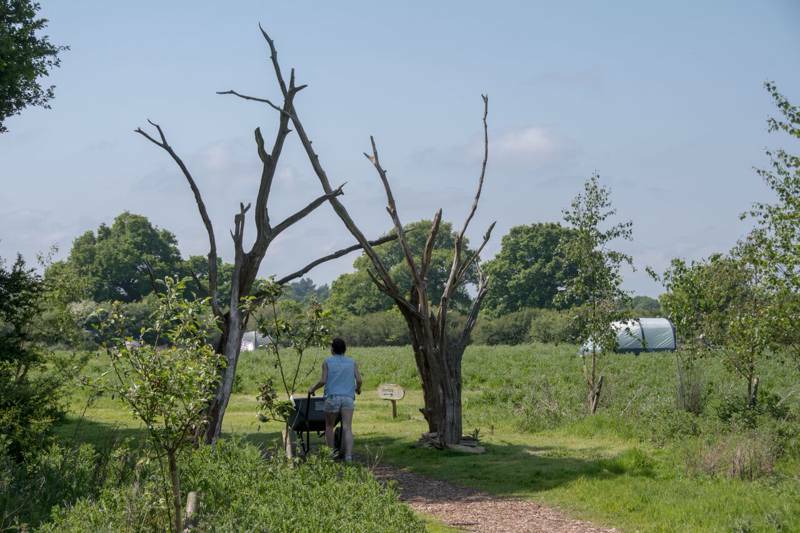 Facilities are sparse to say the least (portable loos, no showers), but that's all part of the charm of this place – a real throwback to the days of building dens and stories round the campfire. 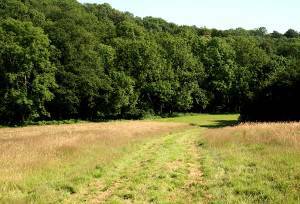 The south-facing site's open grasslands, fringed by copses of enchanting woodland, are free to explore, unencumbered by roads, permanent buildings and grazed upon by cattle in the winter months. This is seriously low-impact camping. And from its enviable location in the heart of the High Weald, the charms of West Sussex are eminently explorable. Take the steam locomotive Bluebell Railway and chug your way through the region. Or for chugging of a different kind, there's a cracking traditional country pub in The Cat Inn, mere metres' walk from the campsite. 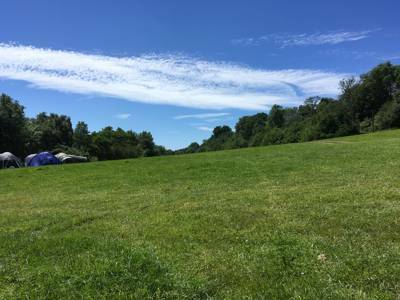 The campsite is nestled on the south facing valley of the farm with beautiful views of the Sussex Weald. 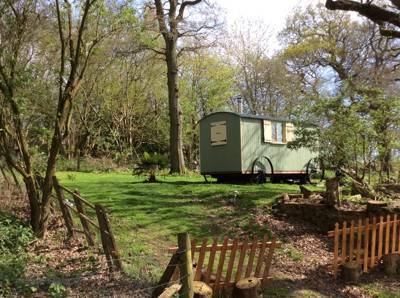 The site extends to include over twenty acres of secluded meadows, and small copses of woodland giving each pitch a unique feel. 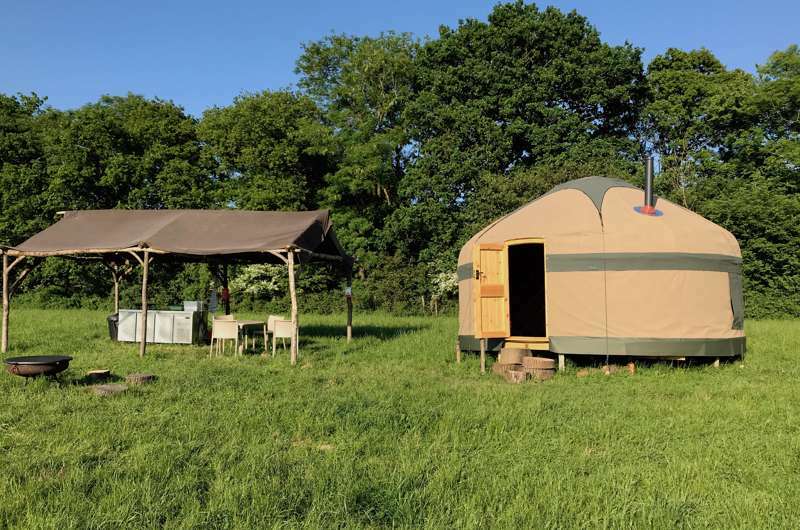 The site offers an opportunity to camp in the authentic English countryside, but only a short journey from the hustle and bustle of nearby London, Brighton and Tunbridge Wells. The patchwork of small meadows makes the site perfect for family camping, with the Top Field large enough for games of cricket, football, badminton, the list goes on. 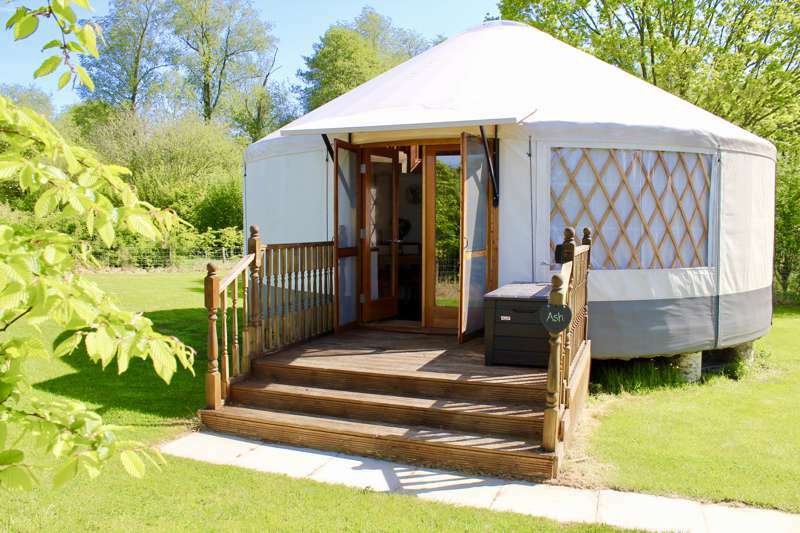 The Lower Fields offer more tranquillity where you can have a secluded pitch perfect for couples looking to have their own space and peace and quiet. 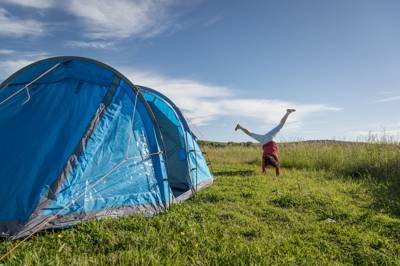 You will experience true wild camping, there are no permanent buildings on the site, no showers and no main roads and over the winter months the site is grazed by cattle. 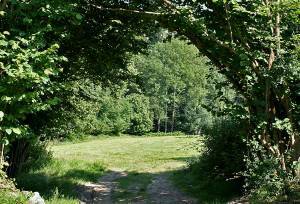 The campsite is designed to have a minimal impact on the landscape and environment. We feel this gives the site a natural charm. 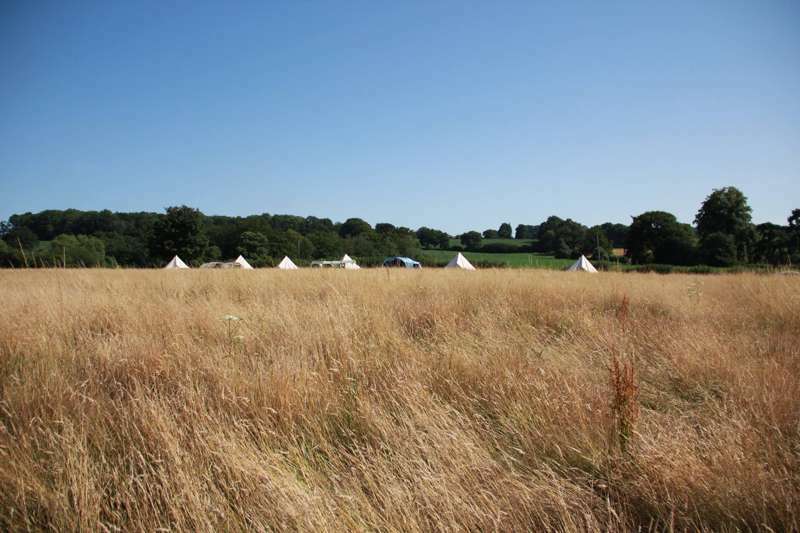 20 acre site with ample space for 10 pitch-where-you-like tents. Portable toilets, several water points and basins. No showers. Clay pigeon shooting available on the farm. Campfires allowed. The Bluebell Railway (01825 720800) is a wonderfully nostalgic way of exploring this Area of Outstanding Natural Beauty. Hop on the steam from East Grinstead to the Capability Brown-designed Sheffield Park (01825 790231). Ashdown Forest (01342 823583) and the Ardingly Reservoir are lovely spots for a stroll. The former has a riding school (0781 809 3880) and served as the inspiration for A.A. Milne's '100 Aker Wood'. The latter boasts a sailing and canoeing centre (01444 892549), plus abundant stocks of pike, carp for fishing. Nearby Wakehurst Gardens is just a mile down the road. This Kew Gardens subsidiary features acres of stunning ornamental gardens, woodlands and a gorgeous Elizabethan mansion. For history buffs, the beautiful Arts and Crafts house, Standen (01342 323029), and Arundel Castle (01903 882173) are both within easy reach. There's a couple of cracking pubs in West Hoathly. The Cat Inn (01342 810369) is a lovely little gastro just 800m from the site which boasts an inventive menu of locally-sourced dishes. The Vinols Cross Inn (01342 810644) promises a friendly welcome and a well-stocked bar. 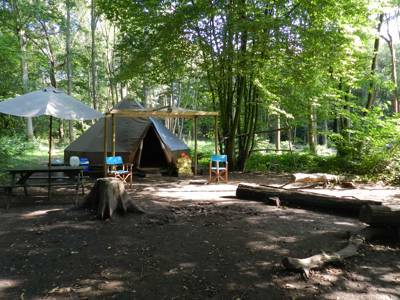 The campsite is open during weekends and bank holidays only for the summer season from May - September. By Car From the North: Take Exit 10 from the A23 onto the A264 eastbound towards East Grinstead, at the roundabout by the Dukes Head pub take the third exit onto the B2028 towards Turners Hill, continue on this road through Turners Hill and towards Ardingly, at Selsfield Common take the left hand turn towards West Hoathly onto the Selsfield Road, follow this road into West Hoathly and take the right hand turn opposite West Hoathly Garage to the centre of the village along North Lane, pass the Cat Inn and Church on your left and continue through the Village towards Hook Lane, the Campsite will be signposted on the left hand side just past the Bowls Club. By Car from the South: Northbound on A23 take exit for Bolney (A272) then head eastbound on the A272 towards Ansty and Cuckfield stay on this road then take the B20236 towards Cuckfield pass through Cuckfield and turn right at the roundabout onto the Ardingly Road towards Ardingly, at the next junction turn left towards Borde Hill Gardens and take the next right past the Gardens onto Copyhold Lane, at the next Junction turn left onto College Road and follow this road towards Ardingly, once at the junction in Ardingly turn left onto the B2028 follow this road through the village and then turn right onto Cob Lane just before the Ardingly Showground, Cob Lane eventually leads into Hook Lane, continue following Hook Lane for 1 mile passing the main Farmyard and several houses, the campsite is signposted on the right just before the village bowls club. By Train: East Grinstead and Haywards Heath Stations are both within 15 minutes drive from the site and have taxi ranks.